Twitter alerted me to the fact that N.D. Wilson was coming out with a new title and, as it had been awhile since I'd read anything by this particular Wilson family member I thought I'd give it a go. I did what I very seldom do and pre-ordered a title. (I'm usually not so antsy.) I thought Outlaws of Time: The Legend of Sam Miracle would be fun to read aloud to my kids. (For reference sake, my kids range in age from 1-9 years old.) Having read a few N.D. Wilson titles I didn't think much of the need to preview it, but figured on having my kids join me in the discovery. More often than not, I preview new-to-me titles but my oldest has grown up on me to the point where that's no longer always possible. Sometimes we just have to go with books and see what happens! My kids and I launched into this story with gusto. We collectively agreed that the story was "exciting so far" when we were about two chapters in. At about four chapters in the kids seemed a little confused by the tale and it started to drag a bit for us as a group. I asked if they would rather set this one aside for the moment and read something else instead and everyone voted on that plan. This is something we've done with books every now and again. A great book can be enjoyed in various ways and times and laying it down for a bit is not always a negative thing. Sometimes you can know that you will enjoy the book but the present moment is not the best time to do so. I believed such would be the case with Outlaws of Time and I'm happy for that to be the case still. Having made my way a little bit into the story, I wanted to see where it went for myself and decided to preview it before handing it over to Bookworm1 (age 9) to read on his own. Ultimately I am glad that I did so because I don't think he'll be ready for this story for a few years yet. 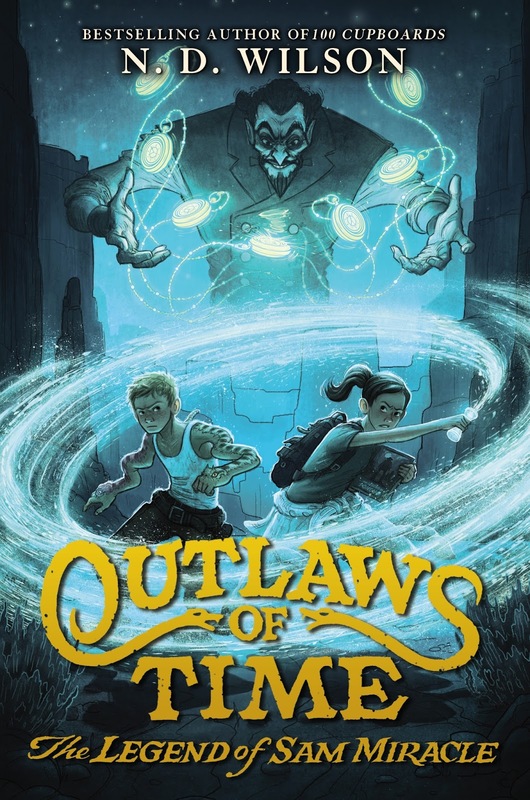 Outlaws of Time reminded me much of N.D. Wilson's 100 Cupboards series in that you have to pay attention to details because he likes whipping his characters into alternate realities. There is a lot to track with in this story. If you are familiar at all with Wilson then you'll recognize his wit which dances across the pages from a mile away. You'll understand the desire of his to craft a phrase in order to catch the reader off guard every few paragraphs or so. You'll have to read with a plan to pause a lot as you go along in order to catch Wilson's deeper meaning. I suspect that he likes to be read that way. All of this to say, he has a distinctive writing voice and in some ways reading a book of his is like meeting with an old friend. You can smile at your friends' idiosyncrasies and enjoy their company much like you'd enjoy this new Wilson tile if you've enjoyed one before. This all explained, I would offer some caution in the way of a suggestion that you read this story yourself before handing it over to your kids. Sam Miracle is the fallen hero in this remarkable tale about a boy who is called to defeat The Vulture, a villain who has managed to conquer time and space and who can only be stopped by death. Sam and colleagues are also able to move about time but the how and why of this is a bit hazy to the reader as the story begins. Sam is also a bit confused as well, both to time travel and to his purpose in life as his memory is not all that it should be. All he really knows and understands is pain. He has constant daydreams in which he suffers a myriad of horrible deaths at the hands of The Vulture and his cronies. Sam's view of reality is clouded and distorted until the character of Glory is inserted into the story. Glory becomes Sam's female friend and close companion as she is called upon to keep his thinking focused as he is whipped in and out of time with the goal of defeating The Vulture. You'll not find out whether or not he succeeds in his endeavors though, because this is only the first title in Wilson's newest series. Readers should expect to see a darker side of Wilson in Outlaws of Time. There is quite a bit of violence in this title which is not something I'm going to object to point blank in a children's book. Sometimes violence is called for and in this case I think that it is. Saying that though is not saying that I think all children are necessarily ready to read about gun fights, bullet holes in flesh, and crusty blood. Frankly I was glad that my kids opted to sit this story out for the moment because Wilson paints some rather vivid death scenes in this book that I don't think my children are quite ready to handle. Even I wouldn't normally sit down and read this book "for the fun of it" but I pressed on because a.) I bought it and b.) I wanted to find out what happened. Is the violence in this book worse than what you'd find in, say, Lord of the Rings or Harry Potter? No, I don't think so. The "problem" (if it can be called a problem which is debatable) is that I know Wilson is always working to improve as a writer. He absolutely loves being a wordsmith and this drives him to be as descriptive as he can be using new words and clever phrasing to tell his stories. Is this a habit I find fault with? Absolutely not. It serves to make him a colorful writer. This is a good thing! 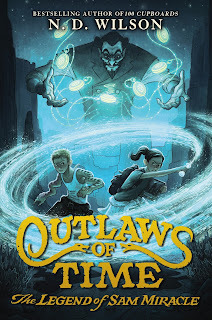 And, in the case of Outlaws of Time, it means you're likely going to want to preview this one in advance of having your kids read it. I wouldn't dare set an age on it because every child reader is different and what one kid of a certain age can handle, another cannot. My nine year old should sit this one out for a few years but I suspect that my seven year old will be ready for it around the age of ten. You're going to need to use wisdom and discernment for yourself and come to your own determination for your family when it comes to this title. Once again, Wilson has presented the reading public a thrilling and exciting adventure story. It just might be a little too much excitement for some. I'd carve that quote on the walls of my house. At the very least, I've seared it into my heart as well as possible. This is an idea that is well-worth passing along to children: we have but one life, so live it well. Or, as others have said, "Do not dare not to dare." I can only add my own "Amen" to that! What a great quote! And a perfect one for you, Carrie.